The New PSC Power Star LiFE is the new gold standard of power distribution products. Engineered using our 26 years of power supply experience, this new single rack space rechargeable power supply will provide you with the ultimate power solution for your sound or video cart. The heart of the system is our custom, 12.8 volt, 20 amp hour Lithium Iron Phosphate battery pack. The individual cells were chosen for their high capacity, and ability to be rapidly charged or discharged. While other cells can only be charged and discharged at a 0.7C amp hour rate, ours are rated at a full 3C rate. Additionally, our cells are factory measured, graded and matched into precision sets for a better quality battery. Unlike other brands, the PSC LiFE battery pack contains built in cell balancing electronics for a long life. 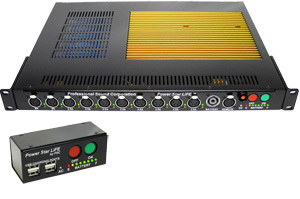 The PSC Power Star LiFE is built around a highly integrated 500 watt, switching power supply. The AC input is fully filtered for both common mode and differential noise, harmonic content and spikes. We designed and built in a current limiting function to further protect our power supply under extreme conditions. In addition, our charger has been designed to provide clean, quiet charging power so as to not cause you noise problems in the field. The DC path of our Power Star LiFE has been designed to provide clean, quiet, reliable DC power for all of your audio and video equipment needs. Each output has its own dedicated output filter that contains both audio and RF frequency filters. Each output is also individually Poly-fuse protected and monitored via easy to read front panel LED indication. 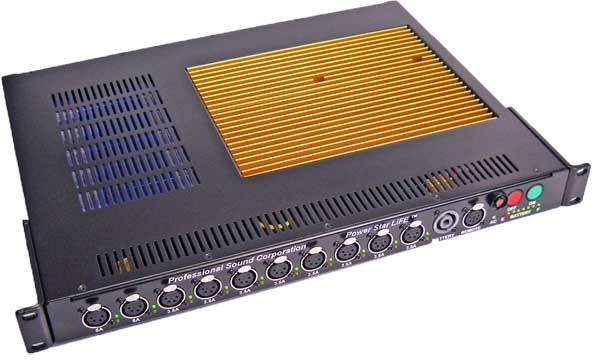 There are a total of ten outputs: two (2) 8 Amp Outputs and eight (8) 3.5 Amp Outputs. To lower internal power losses and extend battery life, our circuit boards are made with 4oz copper, 4 times the industry standard and a PSC exclusive feature! Every PSC Power Star LiFE comes with a small remote control box. The use of the remote control allows the Power Star LiFE to be mounted down and out of the way on your sound cart if desired. This remote contains an additional set of “On and Off” controls, an additional battery level meter and also four (4) USB charging ports. The PSC Power Star LiFE can be operated with or without the remote control box. The PSC Power Star LiFE is convection cooled using a custom made, high capacity aluminum heat sink extrusion. This heat sink provides more than 375 square inches (2419 square cm) of heat dissipation surface. It has been anodized gold for long service life in the field. The PSC Power Star LiFE is equipped with multiple point rack rail mounting brackets. These brackets can be mounted from either the front or the rear of the Power Star Life.